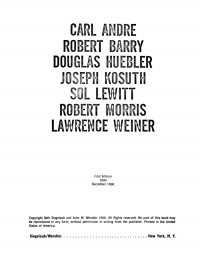 Douglas Huebler (27 October 1924 – 12 July 1997) was an American conceptual artist. May 8 - June 14, 1970, Andover, MA: Addison Gallery of American Art, Phillips Academy, 1970,  pp. Tamara Trodd, The Art of Mechanical Reproduction: Technology and Aesthetics from Duchamp to the Digital, Chicago: University of Chicago Press, 2015, pp. 142, 167, 173, 175. Christian Berger, "Douglas Huebler and the Photographic Document", Visual Resources 32:3-4, Sep-Dec 2016, pp 210-229. This page was last modified on 29 July 2018, at 15:29.